Every few years the trends that naturally occur in real baseball bleed over and change the way we have to approach things in Fantasy Baseball. Prior to the PED era, steals were relatively plentiful and we had to fight for the few elite power bats. I’m not sure we’ll ever stop chasing the big power bats, but when Sammy and Mark started a whole new era with their feats of strength in 1998, stolen bases got a lot harder to come by. We’ve also gone through various cycles of strength at different positions. At one point the middle infield was almost as pathetic as the current pool of MLB catchers. Then we had the big three of Nomar, Derek, and Alex, and they stood so far above their peers it was ridiculous. Piazza and Pudge did the same at the catcher position. There are two major trends I see now that are forcing our hand in fantasy baseball. One is the aforementioned pile of refuse at the catcher position. The other is a change in the way Major League teams are using most of their starting pitchers. The latter trend means we have to change our pitching strategy in Fantasy Baseball or be left sniffing fumes on the pitching side of the standings. I’m not exactly sure when it started. It might have been during the 2016 postseason when Terry Francona used Andrew Miller as a lethal weapon at almost any point in an important ballgame. Or maybe in the World Series when Joe Maddon yanked starting pitchers who were seemingly cruising along and used a mediocre bullpen to mostly good effect. As a Cubs fan, maybe that’s just when I noticed it. Whenever it started, it’s only been emphasized even more with the Rays and their whole ‘Opener’ strategy. The bulk of MLB starters are not going as deep into games, and the bullpens are soaking up more of the innings and the stats we as fantasy owners are chasing. This shift in usage means we have to make a shift of our own in fantasy baseball. We’ll get to the changes I think need to be made in our pitching strategy in a bit. First, let’s look at the big picture of MLB starting Pitchers. While the change in usage has affected all pitchers to some extent, we’ve got a decent sized tier of elite arms who haven’t felt it as much. What this has done is create a pitching economy with an ultra-rich top tier of increasingly valuable arms, and a growing mass of homogenous low-level starters who just might hurt you more than they help you. There’s not very much in the middle. I equate it to the running back situation in the NFL that brought about the Zero-RB strategy for Fantasy Football. We had a few top RBs who were the most valuable players in the game and a bunch of interchangeable parts. If you couldn’t get one of those elite backs it made no sense to draft an RB who was in a committee, when you could grab one of those at any point in the draft. Starting Pitchers in 2019 are very similar. We’ve got maybe two tiers of starting pitchers that seem relatively reliable. After that, it becomes a crap shoot of unproven pitchers with upside mixed in with a few somewhat safe options who probably won’t hurt you. Every year I used to write an article titled, “Drafting a Pitching Staff After the 14th Round.” I wasn’t suggesting it as a strategy, but more as an exercise to identify late-round pitchers who I thought would offer nice values. Some years I think I could have competed with those pitchers. This year? I’ll probably still write a similar article, but there’s no way a fantasy owner could hit on enough of the current crop of bottom half SPs and compete. So what’s a fantasy owner to do? Let’s tackle that question now. Anyone who’s ever researched fantasy baseball auctions has probably heard of the two prevalent approached. One is called The Stars and Scrubs approach, which means an owner does whatever he can to roster a few of the top players and then fills in with smart purchases later on. The other is The Spread the Wealth Approach, which as its name indicates, proposed a very balanced roster with the value pretty evenly spread out. I’ve always been more of a spread the wealth guy, and I still am for the most part when it comes to hitters. Especially in deeper formats. But I think my pitching strategy for 2019 is going to look a whole lot more like stars and scrubs. My pitching staffs will emphasize quality over quantity. It sounds a bit strange. Aren’t we always worried about quality? Of course we are. All I mean by this is I will increasingly emphasize ERA, WHIP, and K/9 rates over wins and innings. 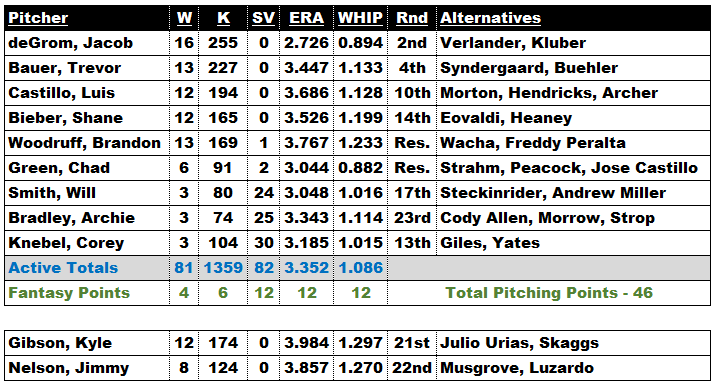 With bullpens taking a bigger bite out of the innings and all of the stats that come with them, I think it will be easier to hang with the pack in Wins and Strikeouts without loading up on seven starting pitchers. So if I’m avoiding those bottom-half starting pitchers how am I filling out my staff? My article, “7 Reasons Middle Relievers Offer Big Fantasy Value in 2019 Mixed Leagues,” might give you a small clue… Maybe that was more than a small clue. After I wrote the middle reliever article a few people took it as a full-blown strategy and had their doubts. It’s not as extreme as that. It’s just more about using a growing group of elite middle relief arms as a weapon to exploit ERA and WHIP, as opposed to relying on that big pile of question marks after the top 50 starters or so. What’s this look like? Let’s give it a go. I figured the best way to convey my ideas on the ideal pitching strategy, I figured I might as well build it. Here’s what I did. 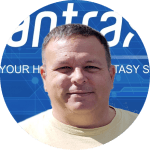 I went into the latest Fantrax ADP and downloaded it to excel. I assigned each pitcher a round based on their ADP. I then went about building a pitching staff using the ideas mentioned above. I used two of my first four picks on elite-level starting pitchers. Again, I believe they are more valuable than at any time in recent memory. Then I spread my pitching selections out a bit, identifying players who fit my mold and felt like values in their respective rounds. Here’s what I came up with. Before you get your britches in a bind, this is not entirely realistic. I looked ahead and identified the pitchers I liked and based the rounds I would use on pitching from that. Of course, there’s nothing stopping you from doing something similar in an actual league. So while there’s some major cherry-picking going on, I did use pitchers in the rounds that Fantrax ADP suggests they are currently being drafted in. It’s at least Lloyd Christmas possible. So take this for what it is; a little exercise to start thinking about how to build a fantasy baseball pitching staff. The projections used are mine. I realize I’m pretty high on Woodruff. For the purposes of this exercise feel free to insert Kyle Gibson or Jimmy Nelson instead. I’d be elated to draft this pitching staff in 2019; even with two of the pitchers, I’d start out with on my active roster coming from the reserve rounds and three more of the pitchers coming in the last three rounds of the active draft. It would be very hard to mess up the offense I could build under this scenario. The big question is, where would it put me in the standings? Well, if my projections are close, I’d most likely have the top pitching staff in the league. As you can see from the table above, my ideal pitching staff would net me 46 out of a possible 60 points on the pitching side. I based the points on the average standings from 2018 12-team leagues on Fantrax, as compiled by @smad_bb. If you’re not buying that, it did almost as well in 2018 12-team NFBC leagues, grabbing 41 of a possible 60 points. Here’s the NFBC data courtesy of Tanner Bell and Jeff Zimmerman and The Process. If you haven’t purchased this it is well worth it, offering advice and resources for fantasy baseball players of all levels. It will seriously help you up your game. Again this is using stats from a nine-man pitching staff where two of its members would not even be drafted in the active portion of a 12-team draft. It’s most definitely getting harder to identify value in the bottom half of the starting pitching pool. That doesn’t mean we can’t find other ways to maximize value from all types of pitchers while also using higher picks to hopefully build just as impressive of an offense. Whether you buy into my pitching strategy completely or not, I do urge you to go through the exercise I did and build yourself an ideal pitching staff. It really helps you realize what it takes to do well. Sometimes you can look at the parts and not realize how good they are as a whole. That’s why pitching strategy is about a whole lot more than just evaluating individual pitchers. It’s about seeing how it all fits together. I think this is an excellent way to look at the pitching landscape, both for this season and beyond. What about for dynasty leagues? Would you approach this much differently than redrafts? I don’t think I’d change too much. My last few rounds in the regular portion of the draft would be dedicated to high upside young starters with upside, and I’d grab good middle relievers in the reserve rounds. If you hit on a few young starters, you might be able to shift some of the earlier picks away from the elite starters to further strengthen your offense… But in basic theory I wouldn’t change too much. The problem with this ‘strategy’ is that it is based off of last season’s performance on not on career performance. It assumes, for example, that Buehler and Bauer are definitively on the same level as a consistent elite arm like Syndergaard. PItcher outputs vary year to year, and much of the time widely. To expect Trevor Bauer to replicate a career season is a major stretch. Until 2018, the guy had major difficulty hitting the strike zone. Luis Castillo and Chris Archer aren’t on the same level as Kyle Hendricks and Charlie Morton. They’re both vastly overrated. As for the ERAs and WHIPs, I think they’re awfully optimistic. Wacha and guys in his tier could easily have a high 4 ERA with a 1.33 WHIP instead of the high 3s era and 1.23 WHIP listed. If you own and play even just one SP like that, it could mess up your pitching ratios..
No doubt projecting pitchers can be a crapshoot. Any pitcher can fall apart, but my projections are generally on the conservative side. Bauer made very real changes in the way he pitches. I’d say my projection is lower than most on him.Bauer Projections But sure use Syndergaard in his place. Woodruff is the only one I’m likely higher on than any other site. Regardless the alternative is using more pitchers like Wacha. Instead by utilizing 4 relievers, I am ensuring that my two aces will have a more extreme impact on my ERA and WHIP. But again, the exercise is the real take from this. Map it out. 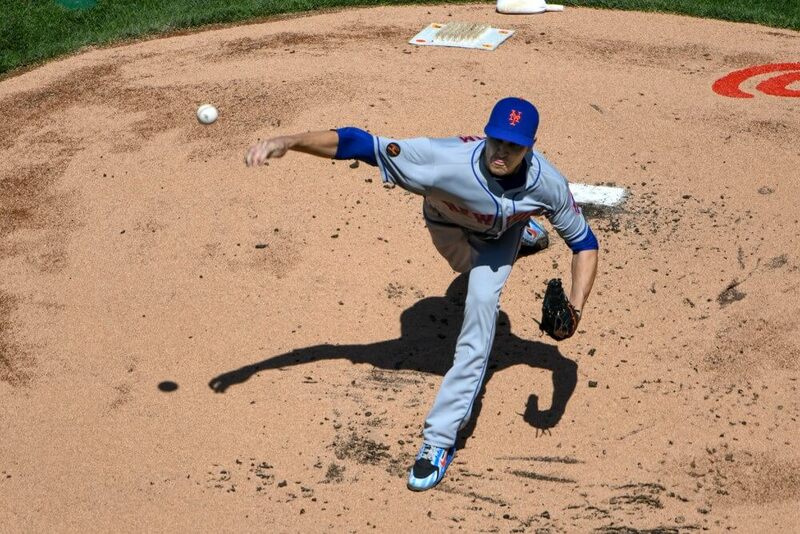 Get an idea of what your staff might look like using different rounds on your pitchers. In head to head point leagues how could you see this approach to drafting pitching hold up? I don’t honestly play a ton of H2H, but I think you’d have to add another closer to ensure you won Saves most weeks along with ERA and WHIP. Then you’d really have to nail it on offense. I think you could win with it, but giving up two pitching categories a lot of weeks means everything else would have to go perfectly.